When I was a little girl, there was a Santa costume in my grandparent’s bedroom closet. I can still feel the texture of the ringlets on the beard when I imagine it. I don’t even have to close my eyes to remember how the red outfit looked spread out on the tall antique bed at Christmas time as I unpacked the balled up newspaper from the large black boots. I remember that feeling of anticipation, excitement and pride as I stood in that room feeling so blessed that my very own grandfather was best friends with Santa. I don’t remember when I was told the story, and when I think of it, there wasn’t really a story. I never heard tales about how my grandfather met Santa or if they kept in touch. I merelly knew that that Santa was so very busy and chose special friends to help him by dressing as him throughout the world, and that my beloved Granddad, John W. Affleck, was one of his dearest friends. I thought I was the luckiest girl in the entire universe to have the biggest secret in the world…that my grandfather knew THE Santa Claus. I remember sitting on granddad’s lap when it was my turn after being in line with all of the other children anxious to tell Santa their Christmas wishes. 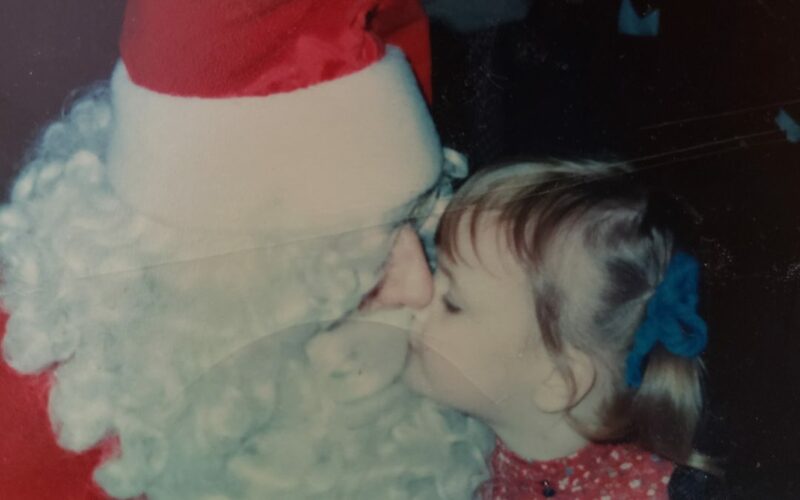 I can hear his “Santa voice” whispering into my ear, “We have a little secret little girl, don’t we?” I remember trying so hard not to let anyone know that I was related to the jolly man giving out candy canes. Oh the many Christmas memories I treasure! I got to ride with him in Christmas parades on floats where I waved and threw out candy to the children lining the streets, and I got to help him get ready (and see him stuff himself into Daphne Pond’s tiny mustang en route to his “performances” as my Grandmother climbed in the backseat). I’ll never forget that moment in elementary school when my teacher was writing memories on the chalkboard for a memory book the class was about to make. I was my usual shy and quiet self, but my classmates eagerly raised their hands to share what they remembered most about the third grade. Someone on the right side of the room proclaimed, “This is the year that we found out Santa wasn’t real.” And the teacher, chalk in hand, nonchalantly wrote the statement on the blackboard. To this day, I could point out on exactly where she wrote those words on that blackboard, and I could identify the desk where I was sitting in the classroom. It was a moment that changed me. I realized that a belief I had based so much of my life on wasn’t true. As hard as I try to recall, I don’t remember anything that happened after that moment regarding Santa and my Granddad and our traditions. I don’t remember having a discussion with my family or with him about the realization. But I’ve always recalled that the moment was significant. I was listening to Christmas music this morning and when I heard Glenn Miller’s “Silver Bells” rendition while driving to the office, memories flashed back to me and I sat in my car for twenty minutes and wrote the below rambles that I decided to turn into a blog post. I had formed a lot of my beliefs about life before I knew the truth, before I realized that my Granddad didn’t really know Santa and that it was all just a magical story told to an imaginative child. I think that “lie,” that story, that fantasy, created something different in my intellect. Something that became a collection of beliefs that I think most people don’t have but should, because it’s true for everyone, not just the granddaughters of Santa’s friends…The belief that anything is possible. The belief that I am special and different. The belief that I have to be extra good and do extra nice and kind things because of my extra blessings. The belief that I am an ambassador for others and therefore have to keep the magic alive and make sure people believe. I wish I could remember what happened after I found out that “Santa wasn’t real” on that memorable day in school. I don’t know if I changed as a person or if I was sad, depressed or confused. I don’t remember anything at all about what transpired after the bell rang that afternoon. 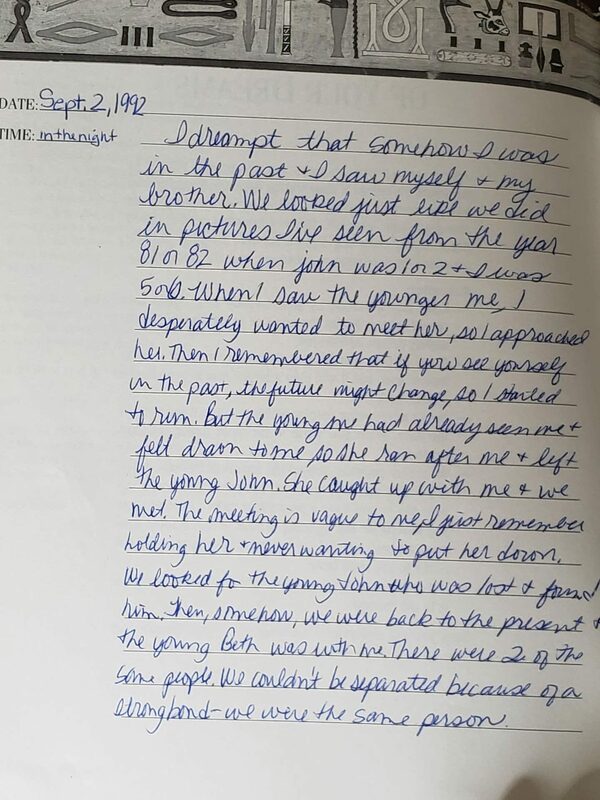 But I realized today, as I’ve been typing this, that for my entire life I’ve been looking for that little girl inside me who believed that her Granddad knew Santa Claus. And I realized that this Christmas will be the first one since then that she’s actually here with me once again. I found her. And I love her so much. I love her faith, her hope, her joy, her happiness, her confidence. And I love the fact that she stopped waiting for me to find HER and she finally found ME instead. Today I also understood the exact moment when she, Lizzy, most recently started to resurface more frequently. When I (Beth) started to finally remember her, though unknowingly at first. Now I understand what happened in that moment and why I sobbed like I had never sobbed before. And why that moment was the beginning of a new chapter in my life. That moment I’m recalling was in February 2015 when singer/songwriter Edwin McCain strummed his guitar and played my favorite song called, “What Matters” (when my lifelong friend interrupted the concert, handed him a slip of paper and told him I needed to hear it). I had said a prayer in my car on a particularly tough day a few weeks prior to that night, asking God for a sign that the life changes I was pondering were the right decisions to make. Less than 30 seconds after that prayer, my cell phone rang and I was told that my tickets were upgraded and that I was being overnighted front row center seats to the Edwin concert. It was at that concert and at that moment when I heard my favorite song, “What Matters,” being played specifically for ME (a song I had played so many times through the years), that something happened to me. I look back on that experience and it’s as if I knew some sort of shift was occuring, but I didn’t understand. But now, and nearly every single day lately, it’s becoming clearer and clearer that it was the mark of Lizzy’s comeback. Apparently she’s been scheming some Christmas-worthy magic my entire life behind the scenes and has decided to come out to play. Recently, as I look back on the past decades of my life as Beth, everything is beginning to make more and more sense. And I have SO much more I want to share, especially about another huge realization about the spirit of Santa, more appropriately the spirit of Christmas, that I discovered. Today, as I was writing about when I realized Santa “wasn’t real,” I realized that Santa IS, in fact the most magical truth that indeed exists. Except for the significant twist that Santa is not a bearded man and Christmas can come every single day of the year, not just in December. It IS the spirit of Santa that can make every dream come true for young and old alike. Santa is a metaphor for the combined “forces” of God, Jesus, angels, our dearly departed loved ones, the great saints, the beloved religious leaders of all faiths–the collective group of beings I call “THEM.” I’ve been writing poems about THEM for a few years now. It’s as if I’ve been sitting on Their lap waiting until it was time to share Their “little secret” in a way that people in the long “Christmas wish line” could embrace. Today, I think They gave me a way to do so, in prompting me to realize that Their story is really nothing more complicated than the Christmas story of Santa Claus. THEY are our magic Santa, and if we have childlike faith, hope and love, we can ask Them for ANY wishes and they will deliver them (though unfortunately often not as fast as Amazon Prime and sometimes not in our preferred package/brand…. but nonetheless exactly as we need them and promptly when we need them). Wow, I have to pick up my kids from school though I’m just getting started with what I want to share. Thanks for sharing your time with me by reading this outpouring of my thoughts. It means a lot to Lizzy, especially. Because everyone has a Lizzy inside and she wants you to find yours too, or let yours find YOU to come out to play. We both promise you won’t regret it! Thank you Lizzy ! Let the sun shine down on the spirit that carry’s this special saviour, Beth forward in her journey. The endless desire and devotion she has for others is an inspiration, uncommon. Her gift is unparalleled and the force for giving is a true testament to her knowledge that she has a gift for mankind. From her love of Santa, to her creative genius we witness her movement. Bless this soul and guide her. BETH IS A GIFT TO THE HUMAN RACE. Protect her on this journey and help her bring others to her fold. Let man reap the rewards she delivers and let her heart swell with pride. Success be her fortune, goodness be her light and joy among hearts be her final destination. As Santa is a true vision for us all, Beth is the light and the glory among men. A CHOSEN ONE. I’m happy when you’re happy. I’m glad you found Lizzy. She was there all the time. She was guiding you in everything you do and have done in your life. She pushed you to come to Red Cross the very first time and as I recall my chin dropped when you asked if I ever needed help. Need it? I wanted to hug you. That was a long time ago and we’ve both crossed many bridges since then, but you, Lizzie and me always touch hearts. I love you dear friend. And I’m glad we’re still together. You, me nd Lizzie.